NEWEST FOODIE: Welcome to the newest member of the Jonathan’s Ristorante family. The restaurant’s manager, Alex Vergara, and his wife Christina, announced the birth of a son, Nicholas Alexander, on Friday, June 28. Nicholas, pictured right, weighed in at 8 pounds, 8 ounces. RICH, COLOMBIAN COFFEE: Many coffee drinkers got hooked on Georgio’s Coffee Roasters bespoke beans when Georgio and Lydia Testarossa did their roasting in Huntington Station. Now in Farmingdale, the coffee house recently set a record paying the highest price ever paid for unroasted, green Colombian coffee in the Western Hemisphere and Europe. The $120.05 price tag paid by Georgio’s was hit at a Grounds for Health charity auction held on the internet. The nonprofit sets up clinics for cervical cancer screenings in Latin America and is one of the most helpful works for the women in Latin America, many of which have never been to a doctor, according to Georgio. The coffee, labeled simply as HR61 is from the 12 to 22 kilos of a unique unclassified varietal produced each year on one plot of land at Hacienda El Roble in Northern Colombia. Georgio’s Coffee Roasters had visited the farm four years ago and has been buying coffee from them for 15 years. When the coffee arrives it will be sold for $20 per 2-ounce packets, as well as by the cup. Flavors of honey, green mango, grape and lemon have been noted. PARKING LOT PARTY: Live music, food and suds from SweetWater Brewing Company will highlight a parking lot party and beer at The Lark Pub & Grub in East Northport this Friday. Atlanta-based SweetWater will release its Jolly Green IPA as part of the festivities, which kick off at 4:20 p.m. Proceeds will benefit the families of Master Sgt. Christopher J. Raguso, of Commack, and Staff Sgt. Dashan J. Briggs, of Port Jefferson, airmen from the 106th Rescue Wing who were killed earlier this year in a U.S. military helicopter crash in western Iraq. The Lark is located at 93 Larkfield Road. Call 631-262-9700 for more information. DELI CLOSING: Park Avenue Deli, which has served customers along Park Avenue in Huntington for over 35 years, will close its doors later this month. Owners Stuart and Frieda Fischer announced Saturday, “with mixed emotions, that we are hanging up our aprons. Huntington’s community supported us with loyalty and love and we thank each and every one of you, but time stands still for no one, and it’s time for us to enjoy the fruits of our labor and sail into the sunset.” The last day of business for the 410 Park Ave. deli will be July 15, the Stuarts said. SURF & TURF SPECIAL: Did you know that Blackstone Steakhouse offers a $59 per person, three course surf and turf meal on Sundays? The special includes choice of signature salad, Caesar salad, fresh mozzarella or spicy tuna roll to start. Then move on to the 16-ounce filet mignon and sliced, 2-pound Maine lobster with choice of creamed spinach, mashed potato or baked potato. Finish things off with a dessert — either cheesecake, chocolate cake, Haagen Daz ice cream or sorbet, along with coffee or tea. To make a reservation, log on to Blackstonesteakhouse.com or call 631-271-7780. Blackstone is located at 10 Pinelawn Road in Melville and is open 4-9 p.m. on Sundays. 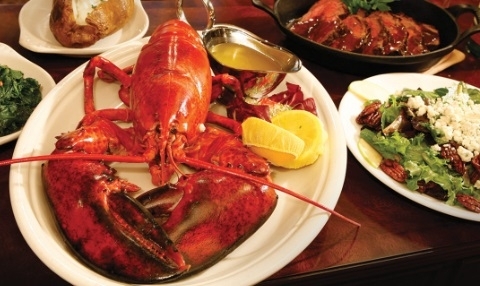 Blackstone offers up a surf and turf special on Sundays.